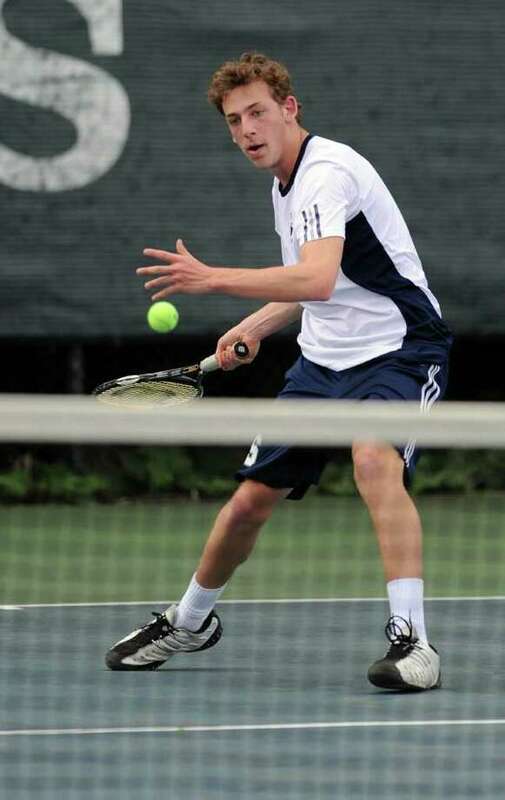 Jesse Heussner plays tennis during Friday's game against Greenwich in Westport on April 29, 2011. This is where the Staples boys tennis team resides after its convincing 6-1 home victory over Greenwich Friday. Staples raised its record to 9-0 in its second straight regular-season victory over the Cardinals (a 4-3 road-victory last year). Greenwich dropped to 8-1. "I think it's a good win against a good team," said Wreckers Coach Kris Hrisovulos, who is humble and honest about his team's victory. "Obviously, Greenwich wasn't at full strength. We're very even when both teams are at full strength. If we got a close win, they could say they'd be better than us if they were at full strength, but by beating them convincingly, it shows that if they were at full strength, it could have gone either way." Originally, the match was scheduled for last Thursday but the rain moved it to the next day. One problem for Greenwich and that was three of its singles players, junior tri-captain Tyler Kratky and sophomores Blake Niehaus and Tatsuya Tasaki, who play at first, third and fifth singles, respectively, were playing at a United States Tennis Association regional tournament and had to miss the match. This caused the Cardinals to revamp their lineup with players moving up the ladder. Nevertheless, Staples can't control who it faces and deserves credit for its inspired play. "It's great to beat them two years in a row and it feels good," Wreckers senior co-captain Danny Hirschberg said. "Winning convincingly is huge for us because it boosts our confidence." Hirschberg, who is the defending State Open champion and defeated Kratky, led the Wreckers with a 6-0, 6-1 victory over senior Andrew Blumberg. The defending State Open champion dominated the match by getting his serves in and smashed many winners past Blumberg. "I knew going into the match that his backhand was weaker and I hit 90 percent of my shots there," Hirschberg said. "My serve was on and I tried to serve to his backhand." Keeping it in the family, Hirschberg's younger brother, sophomore Jake Hirschberg defeated junior Mike Grund, 6-2, 6-2 at third singles. Jake hit a few passing shots for winners and forced Grund into making errors. "I was hitting my forehand very well and instead of slicing it, I was attacking it," Jake Hirschberg said. "He had a very good serve and did a good job of getting it in but I was able to control the point." Junior lefty Graham Hyman (6-1, 6-1) served a few aces and was in command throughout in a 6-1, 6-1 victory over Cardinals junior tri-captain C.J. Purse at fourth singles. "I served well, got in my first serve and I was able to control the point," Hyman said. "He played aggressively and kept it in play but I was able to attack his backhand, which is a bit weaker." Senior Justin Kleiner clinched it for Staples with a 6-3, 6-2 victory over sophomore Mark Chien at fifth singles. Kleiner roared back and played near-perfect tennis after falling behind 3-0 in the first set. "I got off to a slow start but I was able to focus better and raise my game," Kleiner said. "He [Hrisovulos] helped settle me down, which was a big part of it," Kleiner said. "I wasn't really nervous but [through his guidance], I was able to get my mind back on track." Greenwich won at second singles behind freshman lefty Ari Cepelewicz with a 6-7 (7-5), 6-2, 6-2 verdict over senior co-captain Jesse Heussner. Heussner, who is battling an injury remained scrappy against his feisty and quicker opponent but in the end, the southpaw Cepelewicz hit a few drop shots for winners and forced the Wrecker captain into hitting errors. "It [Heusner's injuries] definitely made a difference and he could have won [if he was healthy]," Danny Hirschberg said. At first doubles, Staples junior Evan Davis and freshman Baxter Stein set each other up well in a 5-7, 6-1, 6-4 over senior Lucas Seigmund and freshman Phil Goransson. The Wreckers won at second doubles behind junior lefty Steve Thomson and freshman Luke Foreman by outlasting senior tri-captain Will Benenson and classmate Alex Torelli in a third-set tiebreaker, 7-6 (7-4), 3-6, 10-6. "I wanted to take a look at different doubles teams and on the singles side, I have three players who are playing good tennis and Jesse is coming back from an injury. The big thing is to have a good start and finish with a purpose and we did it. A lot of matches start strong. We had adversity but finished strong. I'm looking for a good start and a stronger finish." And anyone who would put an asterisk next to the result would find it to be an ill-advised move because Staples is confident it would have experienced a similar result against a full strength Cardinal lineup. "It definitely made a difference and changed things for us," Danny Hirschberg said. "Obviously, it would have been closer but we still would have the match."